THE fear of being choked to death by a smog of atmospheric carbon monoxide (co) has prevailed ever since the beginning of the industrial revolution (New Scientist, Vol 151, No 2045). The study of co gas is important because the levels of its emission are much more than that of any other pollutant. Also, high emission of co could use up the available hydroxyradicals (free radicals), consequently reducing the ability of this chemical to oxidise and remove other pollutants like sulphur dioxide and methane. It is also the main cause of global warming and ozone depletion. Studies conducted by Patricia Martineria and colleagues at the laboratory of Glaciology and Geophysics of the Environment in Saint Martin d'Heres, France, show that nature has been more efficient than expected in removing excess co from the atmosphere. There has not been any significant increase in global concentration of co during the industrial era although activities like the burning of coal and wood have doubled from one billon tonnes to 2.7 billion tonnes a year. Estimates done in the '80s show that concentration of the gas in the atmosphere was only one-third the level present today and there has been a regular six per cent rise every year, thereby suggesting the positive role played by nature. But lately, scientists had to rework the idea that there is a firm link between the growing number of co emission sources and the rising concentration of the gas in the air. 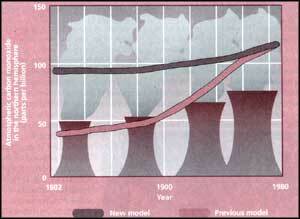 It was found that co level in atmosphere dropped by more then 10 per cent between 19.90-1993. This erratic rise after 80's and fall between 1990-93 in concentration has still not been understood. Seeing this, some scientists have started assuming that all this sudden rise and fall may be linked to the impact of eruption of Mt Pinatubo in 199 1. But this forced researchers to assume that their extrapolation of concentrations based on data restricted to the past 40 years is faulty; which is, again, not possible since nature does play an efficient role in converting co to C02. The extrapolation suggested that concentrations of co in the northern hemisphere had risen from around 40 parts per billion (ppb) in the pre-industrial era to around 120 ppb today. But Martineria reported that the concentration of co in the atmosphere in the year 1802 was 92 ppb and thereafter it slowly rose to 110 ppb in 1947 (see graph). In Antarctica the concentration has remained constant, that is, 60 ppb for about 50 years, thus suggesting the efficient role played by nature.